A portion of all product and service sales are donated to St. Jude Children's Research. "Made with 8 generations of love!" All natural formula that soothes enriches, renews dry and patchy skin. I started making lipsticks at home, and they became in such high demand, that it was like a full time job. The bigger the orders and more color demands, I found it so much easier to just hire a lab who can make a wider range of colors than my reds. I use the same formulation that I did at home, along with the help of the colors that my lab creates. 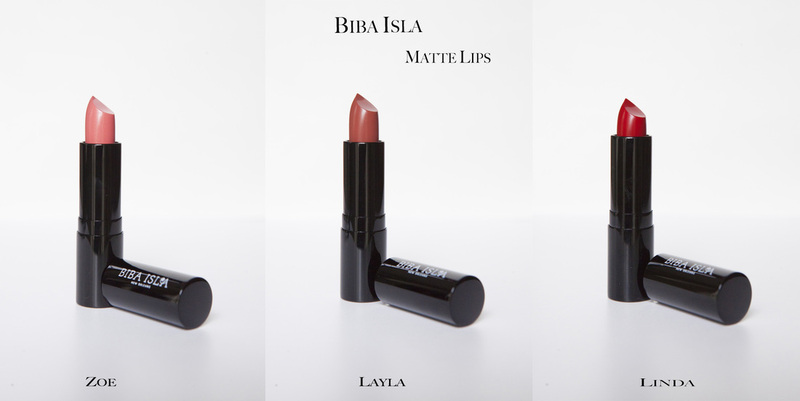 Biba Isla Matte is safe, hypoallergenic and FDA approved. MATTE LIPS: Luxurious matte finish, that moisturizes and heals your lips, making them soft and kissable, no stain or after taste. 16 shades that you can easily mix to create your own signature shade. ﻿﻿Vitamins A, C, E are blended together for antioxidant protection. All lipsticks are Hypoallergenic, fragrance-free, paraben-free. Ingredients: Microcrystalline wax, Kaolin, Candelilla Wax, Castor Oil, Sunflower Seed Oil, Vitamin A, Vitamin E, Vitamin C, Squalene. May Contain (depending on shade): Iron Oxide, Mica, Titanium Dioxide, Manganese Violet, Red 7 Lake, Red 21 Lake, Red 28 Lake, Yellow 5 Lake, Blue 1 Lake.